EVERY OF THE STUFF: HOME // OUDOORS: diy patio party! 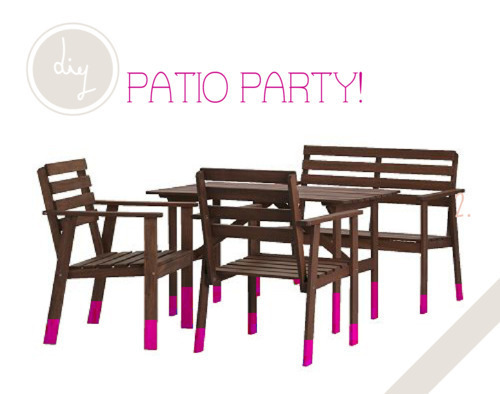 HOME // OUDOORS: diy patio party! the weather here in austin is gorgeous! there are surely only a few beautiful days where the highs remain in the 80s, and i’ve been inspired to get our patio sorted the heck out! the foundation of my grand diy patio ideas is this Tullerö patio set from Ikea. we saw it last year and thought it a bargain at $149 for the whole set, but yesterday, after what was supposed to be a “quick” trip, i discovered that the “new lower price” on this set is $99! done. so, it comes in plain acacia wood—-no neon pink at the bottom. but, of course, i just have to add a neon pop to the set! so, prior to assembling, i’m going to tape off the legs and spray paint just the ends in neon pink! i can’t handle the ugly plastic hose holders that are easy to come by, but our hose is kind of a snake pit on the ground. 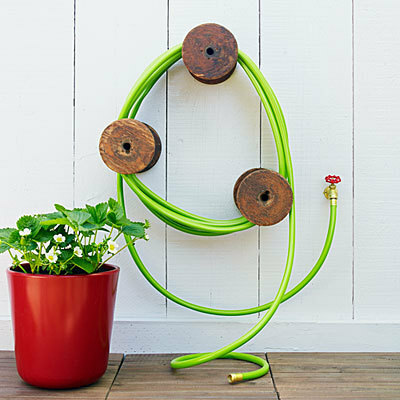 i think i’ll take a cue from this Apartment Therapy post where they found the great idea of using big wooden spools to wrangle the hose! 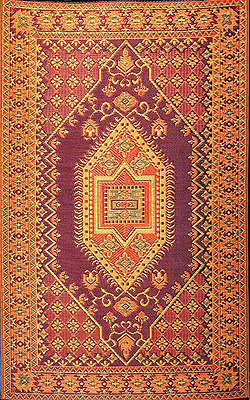 the idea comes from Sunset Magazine, and i’m into it. 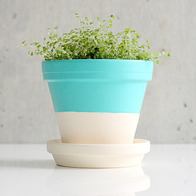 i’ve already posted a colorblocked pot diy that i love from simple street here, but i’m also loving this one from Dellie in bright turquoise. 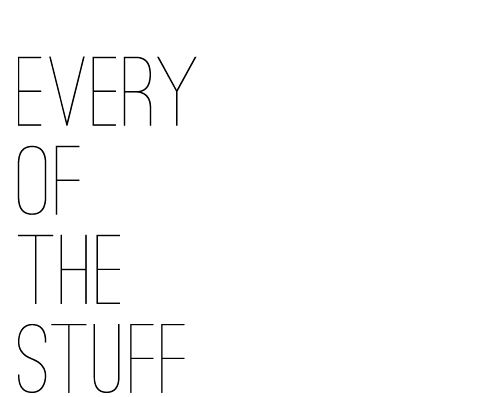 so, the moral of the story is that i want lots of plants. 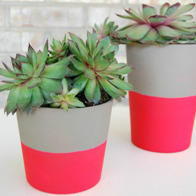 and i want them in colorful pots! so, i’m gonna make that happen! then, the challenge will just be keeping them alive…that, i’m not so good at! we have all of these cross beams in the carport that we use for our patio (i’ve lovingly named it the carporch) which would look simply stunning with hanging plants! 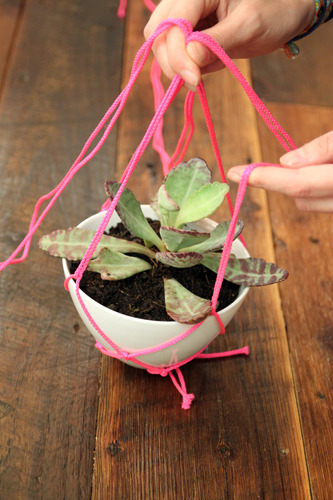 any one that reads this blog can clearly see why i love this diy from Refinery 29. i already have the damned cord! alright, these last two images aren’t diy, but they will help to complete the outdoor room i’m envisioning. 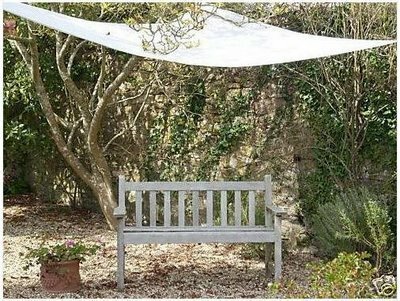 this is the Dyning canopy from Ikea. you know those huge sails that you can get and then string up to create a really modern, cool looking shade over your patio or lawn? yeah. those cost, like $200. Ikea just came out with their version of that which rings in at a cool $24.99. here’s a better look at it in action over at Creed. we got two. we’re not 100% sure where we’re going to put them (off of the side of the carporch?) but they’re happening. 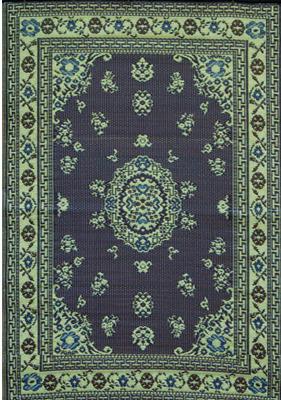 then there’s the outdoor rug i have been dreaming of. so, after the renegade craft fair this weekend (which you should undoubtedly come by saturday or sunday!) it will be time to break out the paint, potting soil and spend a day or two fixing up that darned carporch!